Myocardial edema is a substantial feature of the inflammatory response in acute myocarditis. The relation between myocardial edema and myocardial mass over the course of myocarditis has not been systematically investigated in a clinical setting. 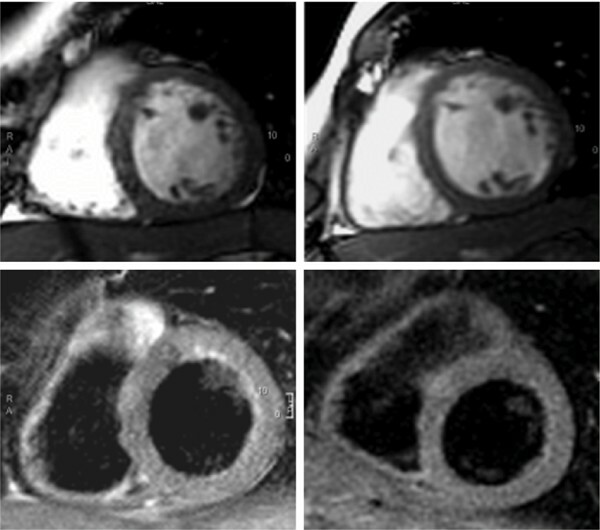 We hypothesised that the resolution of myocardial edema in the course of healing myocarditis as visualised by T2-weighted cardiac magnetic resonance (CMR) is associated with a decrease of myocardial mass in SSFP-cine imaging. 21 patients (16 male, mean age ± SD 36.4 ± 16.1 yrs.) with acute myocarditis as defined by clinical symptoms, history, ECG-changes, rise of myocardial enzymes and exclusion of coronary artery disease on X-ray coronary angiography underwent CMR (1.5 T) at day 2.6 ± 3.1 after acute onset of symptoms and 274.3 ± 279.5 days later. For visualization of edema, a T2-weighted breath-hold black-blood triple-inversion fast spin echo technique was applied and the ratio of signal intensity of myocardium/sceletal muscle was assessed. Left ventricular (LV) mass, volumes and function were quantified from biplane cine steady state free precession images. As a control group for interstudy reproducibility of LV mass, 11 healthy volunteers (7 male, age 31.6 ± 2.8 yrs.) underwent CMR twice within one week. In the presence of acute myocarditis, the LV mass was not overt hypertrophic but still within normal values (156.7 ± 30.6 g). A significant decrease in LV mass was observed during follow-up compared to the acute phase (156.7 ± 30.6 g vs. 140.3 ± 28.3 g, p =< 0.0001, see Figures 1 and 2). In patients with myocarditis, myocardial edema and LV-mass were assessed by CMR acutely and after 9 months. The findings suggest that myocardial edema is reflected by a reversible increase in LV-mass and by high signal intensity in T2-weighted imaging. In controls, the interstudy difference of LV mass was lower than in patients (5.1 ± 2.9 g vs. 16.3 ± 14.2 g, p = 0.02) resulting in a lower coefficient of variability (2.1 vs 8.9%, p = 0.04). 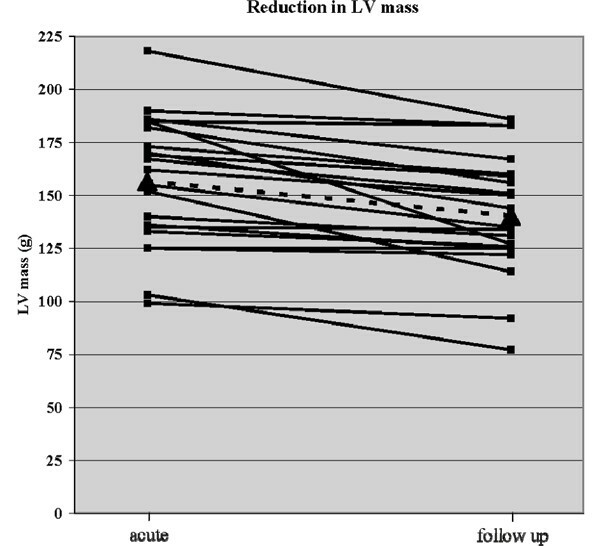 The reduction of LV mass in patients parallels the normalization of initially increased myocardial signal intensity on T2-weighted images (2.4 ± 0.4 vs. 1.68 ± 0.3, p =< 0.0001). In cine imaging, the left ventricular function (LV-EF) was within normal ranges in 18 patients (86%). LV-EF improved significantly in most patients at follow-up (59.9 ± 6.4% vs. 64.1 ± 5.3%, p = 0.015). Myocardial edema in the presence of acute myocarditis is reflected by a reversible increase in left ventricular mass and by high signal intensity in T2-weighted imaging.